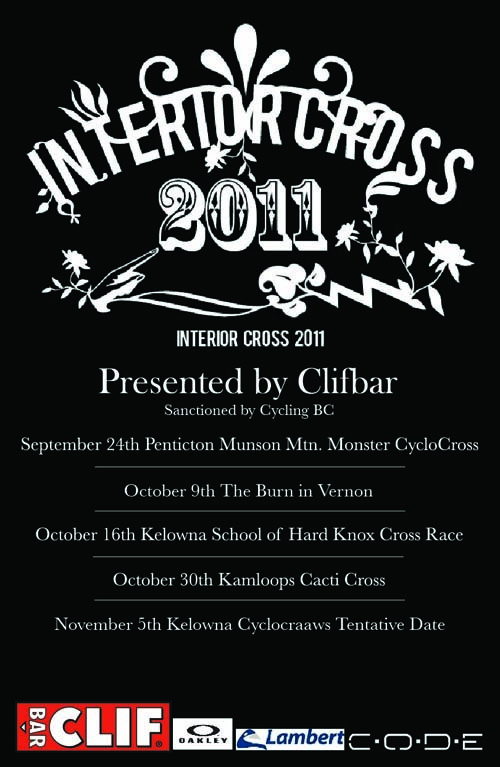 Don't miss out on the second round of Interior Cross this Sunday, October 9th, in Vernon, BC. This will be Vernon's first ever Cross event so come out and show your support. The Vernon Army Cadet Summer training grounds offers fantastic cross terrain and will get your legs ready for The School of Hard Knox Cross race in Kelowna on October 16th. The Interior Cross series was initiated by 2011 Mountain Bike World Champion Catharine Pendrel to offer riders in the interior and all over BC a chance to try out and race cross. Interior Cross offers two starts, A and B categories, and event day registration. You can purchase a single day license on site for $10 and can even race your mountain bike if you don't have a cross bike yet. There are lots of prizes to be drawn and fun times to be had so check out interiorcross.weebly.com.